White Tropical Water Lily - Water Garden Live Pond Plant by Aquarium Plants Discounts at The Net Stores Network. Hurry! Limited time offer. Offer valid only while supplies last. Tropical Water Lilies are spectacular pond plants that can be grown outside in your water garden in all zones as long as the weather is warm enough. Tropical Water Lilies are spectacular pond plants that can be grown outside in your water garden in all zones as long as the weather is warm enough. Tropical water lilies like the temperature to be at least 70 degrees. If you live in areas that freeze, you can winter your tropical water lilies inside and bring them out again in the spring. Tropical water lilies are very free flowering and for the most part, very fragrant. Tropical water lilies come in shades of white, yellow, pink, red, blue and purple. Tropical water lilies come in both day blooming and night blooming varieties. Depth should be maintained between 6" to 18" when first transplanted and then once established can be grown from 12" to 30" deep depending on the variety. You get one white water lily ready to introduce to your pond as is. The plant is shipped bareroot. An exceptionally prolific bloomer, often producing clusters of three or more flowers at once, 'Director Moore' has a medium leaf spread and is adaptable to all but the smallest ponds. Our waterlilies are maturing plants in budding/blooming condition. You can expect blooms within the first days to a week of planting in your pond! This water lily will adjust to the height of your pond. Leave submerged and leaves will rise to the top within weeks. 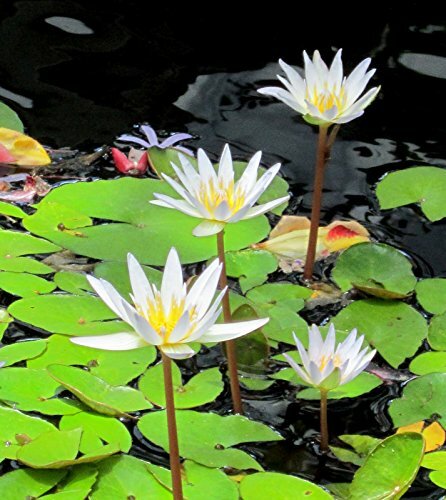 Tropical water lilies are excellent additions to water gardens, tub gardens and small ponds. If you have any questions about this product by Aquarium Plants Discounts, contact us by completing and submitting the form below. If you are looking for a specif part number, please include it with your message.